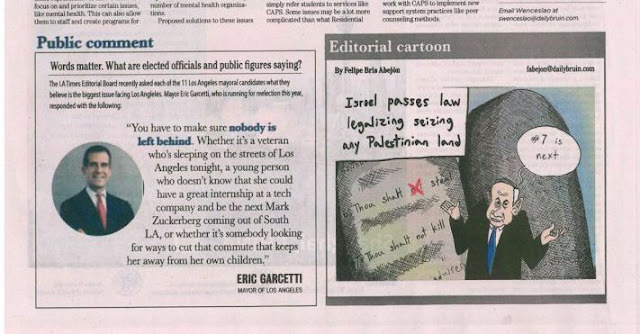 Eye On The World: US: Los Angeles student newspaper follows the lead of its Islamic heroes and publishes Anti-Semitic cartoons. US: Los Angeles student newspaper follows the lead of its Islamic heroes and publishes Anti-Semitic cartoons. "What did you f-ing say?" On noticing that everybody was now watching me, I dropped bugger lugs and walked away, funny enough as I did so, he made repeated claims about how he could had me, if I tried it on with him again. Not for one moment did this so called champion of equality, feel that what he had said was offensive , because to his pea brain, he was morally right. Which brings me to UCLA’s Daily Bruin (A student newspaper) which on Monday published a cartoon which is bigoted, racist and most offensive. Yet as they feel they are morally right, you can bet their bottom dinar that they feel have done nothing wrong. The cartoon published Monday in UCLA’s Daily Bruin shows Israel’s Prime Minister Benjamin Netanyahu standing in front of two stone tablets inscribed with the Ten Commandments. However, in the commandment “Thou Shalt Not Steal,” the word “not” has been crossed out in red. Pointing to another commandment “Thou Shalt Not Kill,” labelled as the seventh by the cartoonist, Netanyahu shrugs his shoulders and says, “#7 is next.” the legend reads: “Israel passes law legalizing seizing any Palestinian land.” The cartoonist, Felipe Bris Abejon, is an undergraduate student in political science, who last year served as education and resources director of the UCLA chapter of Students for Justice in Palestine, or SJP, a strongly anti-Zionist and pro-Palestinian national student group. SJP leaders said they understand the First Amendment limits how much officials can respond to these incidents, but would still like administrators to provide a thorough response to condemn the spread of hurtful information. So in a nutshell when the Anti-Israel crowd do something, that is fine, but when somebody exposes them for the bigots they are, why its a human rights crime. Ah there’s that ‘H’ word again.